Mexico's latitude and longitude is 19° 24' N and 99 ° 09' W . View list of lat long for cities and towns in mexico. 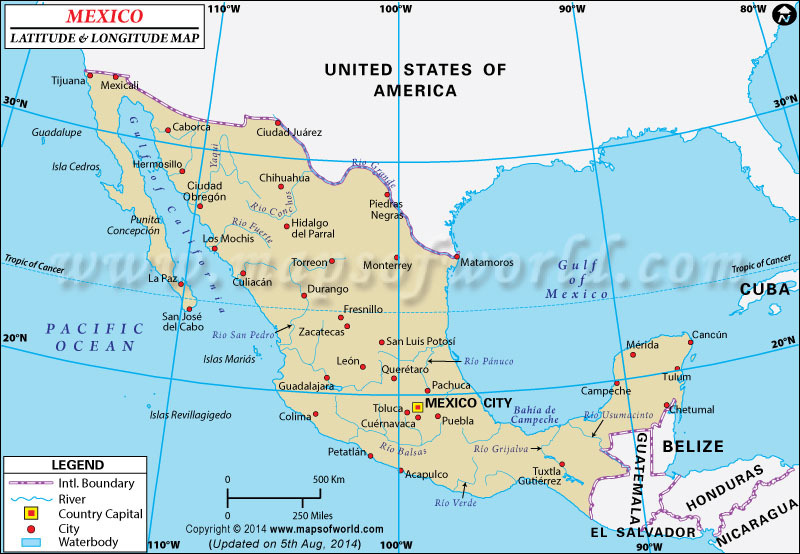 Mexico is located on the geographic coordinates of 19.0000° N latitude and 102.3667° W longitude in North America. Mexico is surrounded on the north by the United States, on the south and west by the North Pacific Ocean, on the southeast by Guatemala, Belize, and the Caribbean Sea; and on the east by the Gulf of Mexico. The capital of Mexico is Mexico City. The latitude and longitude of Mexico City is 19º 24' N, 99 º 09 W'. Mexico is 1 hour behind of Washington DC Standard Time. The latitude and longitude of Mexico includes 1,972,550 sq km of total land area. The climate within this latitude and longitude of Mexico ( Latitud y Longitud de Mexico ) varies from tropical to desert. Temperatures here remain high throughout the year, with only a 5°C difference between winter and summer average temperatures. Best Time to Visit Cancun: Plan to be there with your spouse in between late December and early April. Don't forget to take a glance at the sunrise and the sunset at this place surrounded by the beautiful waters of the Caribbean Sea. Oh yes do try out the traditional Mayan dishes, which is extremely delicious and evokes a feeling of satisfaction of your senses. Catch up with the cool environment while staying at Cancun and make your honeymoon a memorable event.